Why are clowns considered creepy? 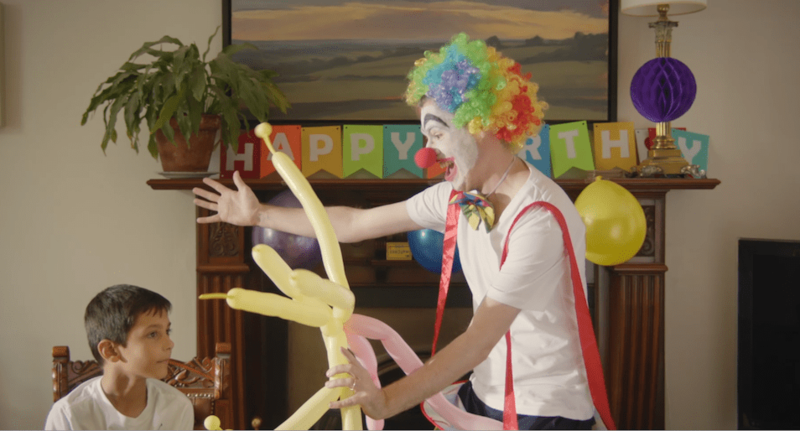 If you’ve ever had a clown at one of your parties, you know how memorable they are for kids. They make us laugh, entertain our little ones and pull off feats of incredible dexterity. The art form of clowning goes far back. The modern clown, that performs slapstick comedy and other types of physical comedy, is derived from the “red clown” character of the 19th-century circus. Unfortunately, they seem to have got a bad reputation over the last few years. A new character has evolved: the scary clown. Why this sudden turn in public perception of clowns? What has changed? Our brains perceive things as “creepy” when there is a slight mismatch between a known pattern and a new image. At this point, our brain isn’t sure if it should be afraid or not. The scientific term for this is “The Uncanny Valley Effect”. It applies to clowns as well as many other things. It’s explained extremely well in this video from Vsause. Don’t worry the video itself isn’t too creepy! As humans, we often react to others based on their facial expressions and demeanour. It’s hard knowing what’s going on when facial features are hidden. For that reason, clowns who wear masks or face paint are hard to relate to and make us feel uneasy. It’s just a mental pattern we aren’t used to dealing with. This is something most professional performers know and take into account. The success of Stephen King’s IT (1990) brought “scary clowns” into pop culture. Coulrophobia – the illogical fear of clowns – has taken a life of its own from being just a fringe phenomenon to being elevated into the mainstream pop culture. On screen, clowns are represented as being human yet not humans. Their movement is humanoid but not perfectly coordinate, their intentions are unreadable and their facial features are distorted. They have big curvy smiling lips, pointy noises, elongated chins and extraordinarily large eyes. By doing this, authors, screenwriters and movie makers tap into our fear of uncertainty and engage us emotionally to spectacular results. How do you make clowns less scary for your kids? The theatrical representation of clowns in movies has little to do with the actual entertainers. Unfortunately, kids don’t necessarily perceive it that way. In the following section, we’ve outlined a few things parents can do to make clowns less scary for their kids. The best way to allay a fear of clowns is to meet one! While kids may initially be frightened of clowns, Silly Sally, a PartyWizz entertainer, says it’s only an initial reservation. As soon as children see it’s fun, they realise that clowns aren’t actually scary. 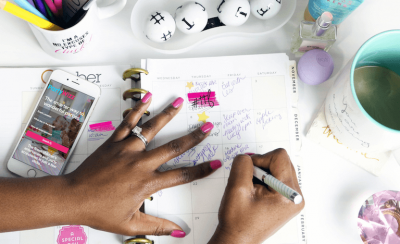 Professional entertains will know how to dress, and the appropriate level of make-up to wear in order to be recognisable and fun without triggering uncertainty for the kids. If your little ones are showing some reservations, don’t unexpectedly thrust them into an unfamiliar situation. Introduce them to the idea of a clown coming to their birthday and share pictures with them beforehand so they get used to the idea. On the day, before the performance, get the entertainer to introduce him or herself to the kids. Let them know they are ordinary people like them; just dressed a bit goofily to entertain them! 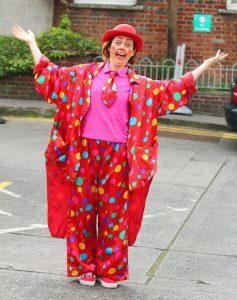 In fact, you can get to know the amazing Silly Sally, a PartyWizz clown, by reading our recent interview with her. Get your kids to see their friends play with the clown. Let your little one watch as their friends have fun with the clown, then invite them to come to join in the fun; chances are they would happily do so. Watching people they trust playing with the clown will reassure them enough to join in the fun. If you think your kids are nervous, stay within reach to provide reassurance and comfort. This will help them relax, feel safer and enjoy the experience. It is also good to reassure and encourage them. Let them know they are safe and nobody is going to scare them. Every kid has his or her own way of processing information. If the setting is reassuring, they will eventually come around. Let them do it in their own time. 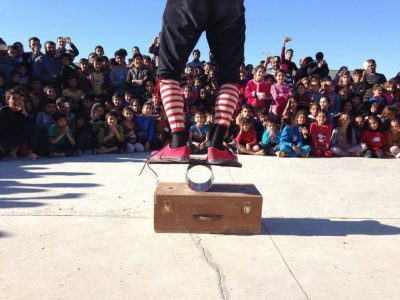 Clowns Without Borders… is that a thing?